Detailed Info Page for PKS1136-135. 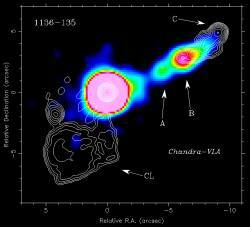 VLA image from Reid, Kronberg, and Perley (1999) available from NED. See Sambruna et al. (2006) and Tavecchio et al. (2006) for new details. Infrared detections of the jet in Uchiyama et al. (2007). The data for this page were last modified on Wed Jun 27 19:59:15 2012.